Yesterday my club put on one of the key classic season opener road races, the Wally Gimber Road Race. As it was the 50th anniversary of this event we wanted to make more of an occasion of it. It seemed like all of the club turned out for this one - either to help at the event or to race in it. Even the sun came out for the occasion and graced us with its presence for the whole day, to our joy! There was a full field of 80 riders, with many still tapping at the door to get in - especially after the Premier Calendar Bikeline (held on the same weekend) stage race had been abruptly halted. Nigel, the race organiser, who had put in months of preparation for this was busily running around on the morning making sure that all was in place. Considering all the logistics involved in staging an 80mile race on the open road - full motorbike and car convoy, technical and medical assistance, marshalling, commissairing, timing/judging, photographers and catering - Nigel looked remarkably calm, even when the race ambulance was late arriving, thus leading to a delayed start. In the car park of the Woodchurch Community Centre there was alot of milling around of the South-East's finest racers, as they made last minute finishing touches to their race preparation, or teams had last minute chit-chats about tac-tics. I was amazed at how many thousand ££s worth of bike was sitting out there in the sun - especially considering that these guys are still classed as amateur racers. Most have day jobs and many do not get sponsored. Finally the race started at around 12.20 and the convoy hit the lanes of the Tenterden/Appledore area of Kent. It was a really active contested with an attack which was made right from the gun. The guy was eventually brought back to the peloton. Another attack ensued with a 4-man break staying away for almost a lap. Then another group of 10 managed to bridge to them, which led to more groups of 2s and 3s leaving the main bunch and joining the front groups of riders. As the course took it's toll with a tough climb to scale each lap, riders were shelled out of the front group and were eventually brought back into the main bunch. The peloton was by no means complacent and teams battled on and on to have riders get away and stay away. As one attack succeeded another the main group again became reduced as more riders joined the front group, and by the end of 3hours the race was made up of 2 distinct groups. Had the course been a little longer a single peloton would have formed again, as the second group definitely rode with mission in the closing stages. 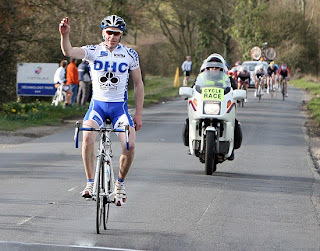 The winner, Rob Hurd (Colnago), won by making a breakaway 8km from the end. The remaining contenders in the lead group were then left to battle it out for second place. It had been a very active race, with all the drama and suspense associated with a one-day Spring classic. Not being eligible to take part in this meant that my part in the event was as a helper. In fact, I was duly assigned the role of co-driver in the one of the race cars. Seeing the race unfold from a following car gives a very exciting inside view. However, it's not all just about sitting there watching pretty coloured lycra on pert bums! There's alot of multi-tasking and thinking ahead involved. With my club-mate Rob, who was driving, we had to protect the main peloton. That meant alerting oncoming vehicles and other users of the approaching race, while taking instructions over the radio from the commissaire and the motor bikers, recording numbers of riders who made attacks. The trick to this, especially in this race which was quite lively, was in being able to judge when to pull into the side and allow a breakaway group to move past us. Many riders attempted to breakaway - some more successful than others. In the car you need to be able to judge via the rear view mirror whether or not each break would come to anything. At the same time you need to stay far away enough to not let the riders take assistance from the car, but not get too close to another group that is in front of us. Overtaking a group of racers on a country lane again needed forethought. For part of the race we lost the signal on the radios so in the absence of instructions we had to make the judgement calls ourselves. On top of all that were also the significant changes of pace - crawling pace on the hills, and during the occasional lull in activity, followed by a screechingly fast pace as the riders hurtled down the mini descents at around 40 miles per hour. At the end of 80 miles and a little over 3 hours we were rather tired - Rob's left arm must have been knackered after all the signalling he'd had to give to drivers to slow down, the whole time! I enjoyed being in the car and seeing the race from a different angle. What I like the most was playing on the CB radios - it was like being a kid again! Anyway, well done to the winner, Rob Hurd, who I understand had been on the verge of giving up racing altogether, not long ago. Huge thanks to the event organiser and our Chairman, Nigel Wood for co-ordinating such a great day out for competitors and helpers alike. Roll on Wally Gimber 2010! Track is Back - Great News!